Your parent gives you advice, offers their life coaching services, or their parental wisdom - but you don't know where that advice is coming from. You may not be totally against chores even though they're a drag, it's just that you don't really want to do them right then. The family is doing something but just at that time you're talking with friends. What do they know about your needs. It's your life, after all. 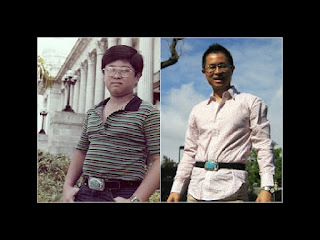 Colin Wee, before and after. 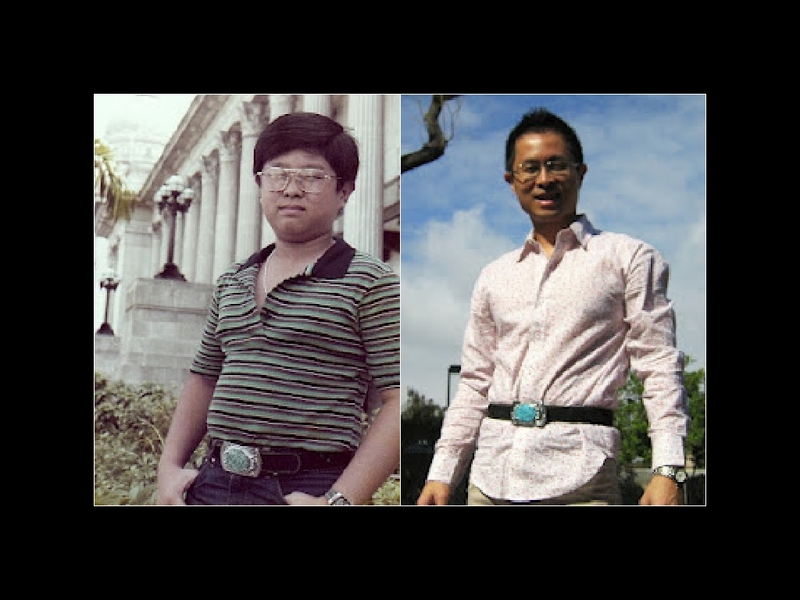 The photo on the left was taken in 1981 when I was eight, the year before I put myself on a portion controlled diet, and two years before I started martial arts training. The photo on the right was taken 2011, thirty years after. I so coincidentally found the same belt - one of my favourites - and decided to put it around my waist to see if I could still wear it. This, folks, is the net effect of hard work, effort, and a lifelong commitment to practice. No one needs to tell you how good it is, or how well you're doing. I do it because I want to, and the inner satisfaction it brings ... is value above many other things I possess in life. While I am a parent, I'm not your parent. When I put myself in your shoes and think of your life issues, the above scenarios could probably get me annoyed. Young adults. Teens. Children. Irrespective of your age or where you are coming from - any untrained person who walks into my dojang is put on a path to develop the kind of power, confidence, and strength of character I have personally forged over my 34 years training in some kind of martial art. I've also practiced other warrior arts and have served in the military for over a decade and a half. More so than the physical training, is the honing of a warrior's mind. Sure, there is a powerful confidence in being able to handle yourself in a physical confrontation. But we also have a code that drives us - which allows us to develop an inner confidence, a peace that comes from self control, and an understanding of how the world works around us. It's not an answer to all of life's issues, this code - The Tenets of Taekwondo - allows us to understand what it is we can control, and what are those issues out of our control. Once you figure this out, you develop this rock solid self determination. Lastly - there is no such thing as age or gender in JDK. You come to us and you put on a uniform you cease to be 'just a girl' or 'just a kid' or 'too young' or 'too immature'. At each and every level you will have the chance to apply yourself and earn the respect for what you put into the practice.